Hydrotech Expands Garden Roof® Assemblies with the InstaGreen® GT-4 Tray - Hydrotech Membrane Corp.
ANJOU, QUEBEC (October 11, 2017) Hydrotech – a market leader in the development and distribution of premium waterproofing and roofing products and assemblies, today announced the introduction of the InstaGreen® GT-4 pre-vegetated tray, an expansion of the InstaGreen® product line within the Garden Roof® portfolio of assemblies. 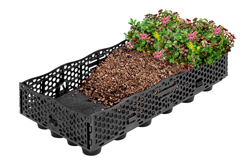 Vegetation options for the InstaGreen® GT-4 tray are a standard sedum species blend designed to accommodate the rooftop conditions. A range of perennials can also be added to provide increased color, texture and habitat features for the pre-vegetated roof. Headquartered in Anjou Quebec, Hydrotech Membrane Corporation is a recognized leader in the development, production and distribution of premium waterproofing and roofing products. For more than 50 years, the company’s flagship waterproofing membrane product, Monolithic Membrane 6125®, has provided waterproofing to more than two billion square feet of roof decks, plazas, vertical foundations, reflecting pools and other structures in 36 countries worldwide. Hydrotech also offers a variety of drainage, insulation and protection materials for single source assemblies such as The Plaza Deck Assembly for plazas and roof terraces as well as the Garden Roof® Assembly, a unique, lightweight assembly for transforming underutilized roofs and plazas into beautiful landscaped and recreational environments. For more information, please call 800-361-8924, visit www.hydrotechmembrane.ca, like us on Facebook, follow us on Twitter and follow us on LinkedIn.